Codebreaker is a big hit in this house. I love it because I can control the level of difficulty and it can be self checking. My son loves it because he wants to help save the day! 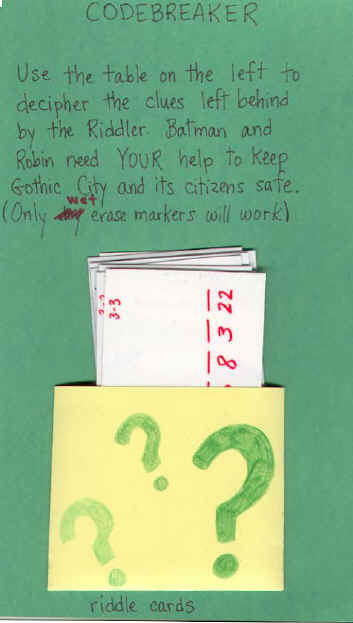 I chose a green file folder because the Riddler was often seen in green. These are 2 sample question cards. Set 3 is terminology from our current scientific study. 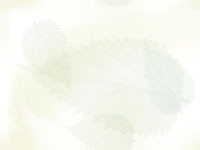 Set 2 is a set of all purpose, important words that are often used in writing and speaking. My cards are made from surplus bookmarkers. I thought the size was perfect so I covered them in white contact paper. I used a permanent marker to write the code and then covered in clear contact paper. At first he used a dry erase marker but they didn't work. They stained my cards!! Now he uses wet erase markers [Vís a Vís] and they come off easily. 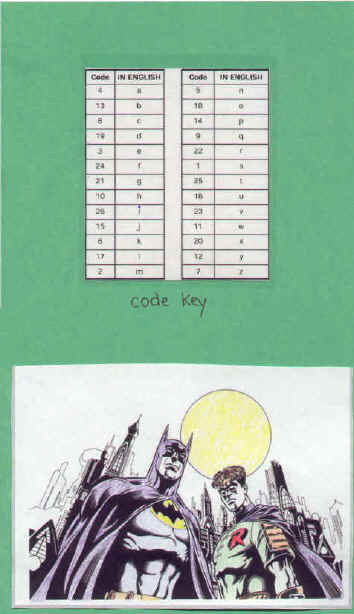 The code and the Batman and Robin picture came from Sarah's files. She was kind enough to send them to me a few weeks ago. You can print them too. Just click on the UP button at the top of this page. If you have younger children this game can still be a favorite at your house. Try cards sets with one or two letters missing from a word. This will allow the child to "solve" larger words than cat and dog. For Kindergarten students you might consider sketching a small picture on the cards as well or using clip art. 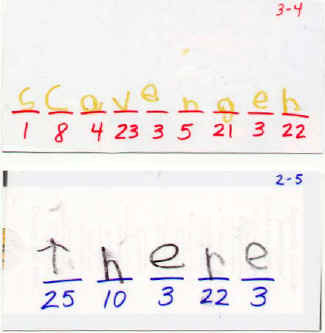 If your child is a very good reader you might consider making one set of cards that form one sentence or question. The sentence you create can be a writing prompt for a paragraph or journal entry. I believe that arranging words into intelligible sentences is a great application of grammar rules. Be sure to capitalize the first word of the sentence to provide a clue for your child. Put the punctuation on the last card.